We need volunteers to sign up for shifts to work our table at this convention style event. 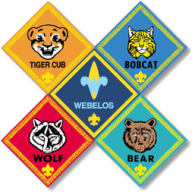 You will great visitors, answer questions about scouting and hopefully sign up new members for our Pack. The theme is Mardi Gras. Volunteers can wear their scout uniform or Mardi Gras type costumes or accessories. Please, RSVP and let me know what hours you can do. I can do setup on Saturday. This is a monthly meeting for adult leaders and parents to meet with people from other units in our district to share ideas and learn new things about scouting. Scouts that placed 1st, 2nd and 3rd at each den level may compete with scouts from Packs in our District. I will distribute more info as it becomes available. Come join us. Find out what we do and add your talents to ours to make our Pack the best it can be. This is our last camping event for this year. Don't miss it! RSVP by April 7th. Cost is $12 per person includes park admission, craft supplies, 3 meals on Saturday and breakfast Sunday. Bring work gloves, sunscreen, water bottles as we will be doing a service project with the park ranger. Awards, advancements, games and a presentation on the Religious Emblems Knot program. I need each den to be ready to present a skit or song for the meeting. www.boyscouttrail.com is an excellent resource. April 26 Rain Gutter Regatta 10am-1pm at the Sarasota Sailing Squadron. We will build, decorate and race our boats all in the same day. This event was outstanding last year. Weather permitting we may get to go out on a real sailboat after our event has concluded. More info to come.